In State pattern a class behavior changes based on its state. This type of design pattern comes under behavior pattern. 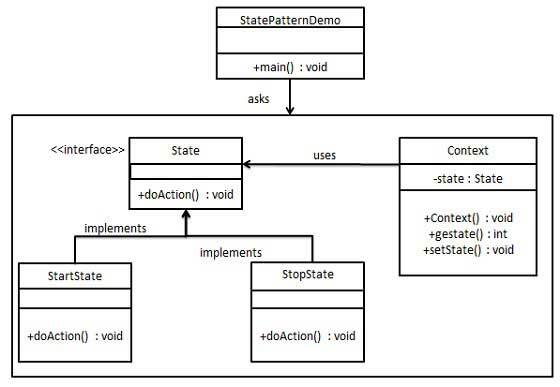 In State pattern, we create objects which represent various states and a context object whose behavior varies as its state object changes. We are going to create a State interface defining an action and concrete state classes implementing the State interface. Context is a class which carries a State. StatePatternDemo, our demo class, will use Context and state objects to demonstrate change in Context behavior based on type of state it is in. Create concrete classes implementing the same interface. Use the Context to see change in behaviour when State changes.